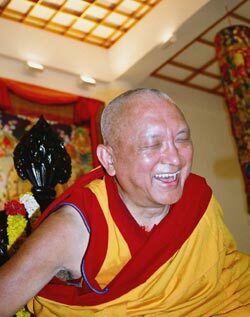 Lama Zopa Rinpoche is happy while teaching at Amitabha Buddhist Center, Singapore. To find more information as it becomes available, and for details of how to contact the center and book for these events, please go to Rinpoche’s Schedule. Lama Zopa Rinpoche surprised the staff at Root Institute in Bodhgaya, India with a 6.00am puja at the stupa followed by a walk around through the old ruins with Dagri Rinpoche (left) and Khandroma. In Nov 2007, Geshe Jampa Thegchog gave a talk which Rinpoche attended on difficulties when one’s mind is weak and how we should have courage when problems arise. Geshe-la advised that we should think that the problems and difficulties are ornaments, as we bear hardships to wear heavy ornaments because they beautify us. An example of this is piercing the body – we are able to endure the pain of the piercing in order to look beautiful. So in the same way we need to have patience, and no matter how many hardships we have, we should bear them for sentient beings. Then Rinpoche told a story about one homeless man that he recently met in New York. The homeless man lived on the streets and had a very worn umbrella to protect him from the elements. 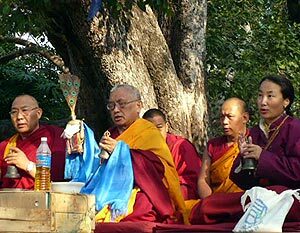 Rinpoche passed him each day when Rinpoche went to the local park to do water offering practice for the pretas. Rinpoche asked a nun in New York to give him her big umbrella, as the homeless man needed it much more than her. Then one day Rinpoche stopped and asked the homeless man what was the most difficult thing for him. He replied “endurance”. Rinpoche immediately put his hands together in the mudra of prostration and said that this is a great answer, a great teaching. Rinpoche went on to say that in samsara difficulties will always arise because the cause has been created, so we need to take the hardships as ornaments and to have courage and endurance. Bringing the total number of FPMT centers, study groups, projects and services worldwide to 150. Sadly, Liberation for our Brother and Sister Animals (which was based in Australia) is closed. With grateful thanks to all whose time, energy and donations enabled the group to benefit beings. Every organization has its own distinctive culture. Around the world, in FPMT Dharma centers and projects, in its policies and educational programs, that culture is infused with the wisdom and compassion of our founder, Lama Thubten Yeshe and our spiritual director, Lama Zopa Rinpoche. See the key points of the FPMT Wisdom Culture! We are delighted to announce that all resident geshes and teachers in FPMT centers will be receiving a complimentary copy of FPMT’s Mandala magazine – we hope you enjoy it! All FPMT centers, projects and services receive a complimentary copy of Mandala. If you have any problems receiving the magazine, please contact Sandra. We would love to receive brief biographies of your resident geshe and teacher! Lama Zopa Rinpoche relaxes with the latest issue of Mandala magazine. Henry Lau, who recently passed away, for his support of Mandala by encouraging friends to subscribe. And if you think you are too busy to ever go on retreat – Lorne Ladner tells how it is possible to retreat from our own delusions, at home: planning your sessions; meditating before work; it’s all achievable. Early last year, as part of its mission to serve the Dharma, the Foundation Store created the opportunity to Practice Generosity as a component of the checkout process. This activity has been very successful! It has generated almost $50,000 for a variety of different FPMT charitable projects and accounts for 10% of the store’s revenue. The Sera Je Food Fund was the leading recipient with a total of $20,596. Other funds that received support included the Education Program, Mongolia FPMT, the FPMT Puja Fund, and the Lama Yeshe Sangha Fund. We would like to thank everyone who participated in Practice Generosity for 2007 and encourage this generous activity for 2008! Please take the time and join us in rejoicing these inspiring acts of selfless generosity! All income from Dharma items is very carefully used by us – see how here. Many Merit Box participants and FPMT centers took advantage of the increased merit on Losar and the Day of Miracles to donate substantially to the Merit Box Project. It was inspiring to see the generous donations made over this period! March 31st is the deadline for submitting donations for the 2007 Merit Box Distribution. This is the first time that centers with Merit Box coordinators have been offered the opportunity to apply for Merit Box grants. Nine different centers have requested support for 14 different worthy projects. We are hoping this number will grow in future years. Following March 31st, the donations and completed grant applications will be given to Lama Zopa Rinpoche. Rinpoche will review the applications and determine how the funds will be distributed. Thank you again to all Merit Box participants for the generous Losar donations. Everyone, please take time to rejoice in all the generous donations made for 2007. If you have any questions, please contact Chuck. We are celebrating the near completion of two new translations! The draft version of the Golden Light Sutra in Mongolian is now up on the website. The Swedish translation of the Sanghata Sutra is being reviewed and finalized and will soon be available for download. After a long wait, the Stages of the Path Basic Program homestudy package is ready and will soon be available on the Foundation Store. Based on the transcript of teachings offered by Geshe Jampa Gyatso for the Basic Program held at Istituto Lama Tsong Khapa (ILTK), and with guided lam-rim meditations and prayers and practices in audio format, this package provides the context for all other BP Homestudy subjects. More Basic Program news from France. Nalanda just had a flying start with its 5 year residential BP in three languages, taught by their semi-resident geshe and new abbot, Geshe Jamphel. Their second teacher, Ven. Fedor Stracke, who taught a first term of BP last summer in Kopan, also teaches BP at Aryatara Institut in Munich and is thereby offering a German BP homestudy option as well. Meanwhile, the BP is available on-line in Italian and in Czech, both also for five years – from ILTK together with Dompipa Study Group in the Czech Republic. Chenrezig Institute continues to offer BP homestudy alongside its residential program. In Spain, Ven. Nerea started teaching the BP in Oseling this February, and Madrid also will be starting. Together with Valencia, Barcelona and Granada, these developments make our Spanish programs a lot stronger and gives a real boost to the development of materials. The Masters Program started again at ILTK in January, courageously taken on by the new MP teacher, Geshe Tenzin Tenphel. The program has seventy residential and even more on-line students, both in Italian and in English, and each has their own qualified tutors. The on-line program uses the interactive on-line learning program Moodle, complete with audio, video, lots of course materials including mind-maps and forums in these languages. All seem to be enjoying so far!! 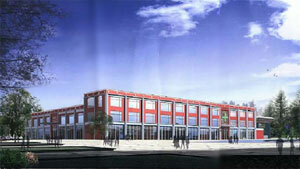 A rendering of the hospital under construction. on the first two floors of the hospital is done, and work on the building continues. Geshe Sopa Rinpoche requested Lama Zopa Rinpoche to undertake this project, and His Holiness the Dalai Lama is extremely supportive of it as well. The Tanoto Foundation and many other kind benefactors have made this project possible. For more information on all the amazing projects that FPMT supports around the world, visit Charitable Projects. Again, MANY thanks to all the centers and study groups who have been reciting the Diamond Cutter sutra at Rinpoche’s request for Ecie Hursthouse. For updates about Ecie’s condition, check out her husband’s blog. 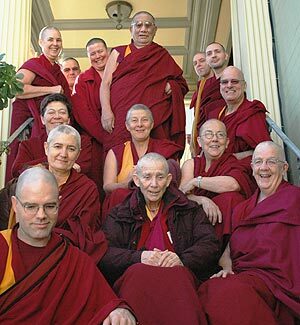 In February, the Bay Area FPMT centers hosted 20 monks and nuns attending the International Mahayana Institute (IMI) Organizational Planning Retreat. Representatives from the FPMT monastic communities and regions of the world were invited to participate in a four-day conference organized by Ven. Losang Monlam, director of IMI. Participants of the IMI Organizational Planning Retreat. The conference drew on the experience and skills of the delegates to creatively assess and strategize how IMI could best serve its community of monks and nuns. A report presenting the collective work of the group will be prepared and shared with the larger IMI and FPMT community. Last year I joined a network of people who have committed, as volunteers, to presenting a one-day workshop in as many places as possible. This workshop introduces the current environmental and social problems, the underlying reasons for those problems, and some ideas for cutting through these mental blockages and implementing a way of life that collectively can bring about a socially just, environmentally sustainable, and spiritually fulfilling human presence in this world. The title of the workshop is ‘Change the Dream’, meaning that the ‘dream’ or ‘story’ that we tell ourselves and each other about who we are and how we relate to each other and the wider ecosystem, is what influences our individual and collective behaviour – and this is what creates the everyday reality in which we live. There is no ‘away’. For most of us, our garbage gets collected and we forget about it – we don’t think about how it gets dumped somewhere that happens to be where other people live – usually poorer people, with less choice and ability to move elsewhere – or even shipped off to developing countries where people have even less choice. Whatever toxins leach out of the garbage affect people living nearby, but eventually those effects spread and affect everyone. (Methane contributing to global warming is just one of the many effects that are global) It is like a very visible and immediate form of karma being played out in front of our eyes, even as we continue to contribute to the process. And like so many other issues – once we ‘change the dream’ and see the deep connectedness of ourselves and all other beings, both human and non-human, it simply becomes second nature to think about where our garbage will end up, and to try reducing it to an absolute minimum in order to avoid inflicting it and its attendant consequences on those less fortunate than ourselves – and ultimately, saving ourselves from those consequences as well. Keep checking https://fpmt.org/jobs.html for interesting opportunities to offer service in FPMT centers around the world. New Opportunities include Mahamudra Center in New Zealand is looking for a manager; the Jade Buddha Relic Tour is looking for a tour coordinator. May there be no war, disease or natural disaster such as fire, flood, earthquake and so forth. May everybody realize bodhichitta, the good heart, enjoy peace and happiness and as quickly as possible realize the wisdom directly perceiving emptiness, cease all their defilements and achieve enlightenment.